As the reigning Miss Browniebabe I am looking forward to passing on the apron to the lucky winners this month. I've already seen a few awesome and very tempting looking brownies pop up everywhere on the blogoshpere. I wonder how Myriam does it? Choosing from so many awesome entires. I'd have a huge problem - besides the fact of easily putting on the kilos just by looking at all of the entries, I'd never be able to choose just the one. Being the current Browniebabe of the Month I thought I would share one of our favorite brownie recipes for everyone. Yes, you all know me well - it has to be one that has plenty of chocolate in it. I have neglected my chocolate addiction throughout the summer and have been enjoying the more fruity desserts, sweets and cakes lately. I have to admit it was an awfully sweet month but my chocolate craving has come back with a vengeance. Like any addict, I humbly give in to it's calling and satisfy the temptation as best as I can. This time with a rich, moist chocolate brownie, with crunchy walnuts and a sprinkling of espresso powder for an explosive combination. One bite and you'll be blown away - I am each time I make these. I really have to slap my hand away from over-indulging in these - it's so easy to. Make these for your family parties, reunions, neighbors and friends - you will be loved for centuries to come. Here every time we have a neighborhood festival I am asked to make these in huge amounts and then I bathe in the "oohhs!" and "ahhhs!" and all the compliments that come my way. A boost for the ego trust me! Are you all ready for the chocolate kick? Ok here goes! Shake it, stir it or blend it - let's get this party rocking with your tempting drink creations. Liquid Dreams is all about mixing up some of the most delicious drinks and bringing it to this months mingle. In a double boiler or a water bath melt the bittersweet chocolate. 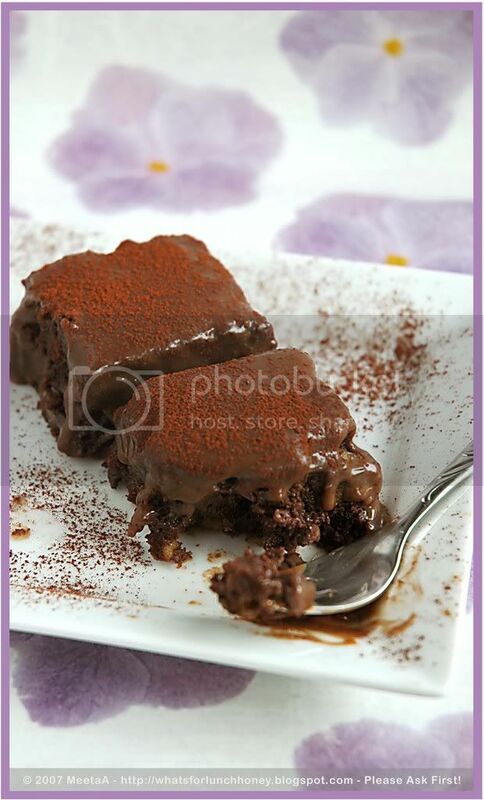 In a bowl mix together the walnuts, flour, chocolate chips, 20g of cocoa powder, salt, and the espresso powder. Set aside. In another bowl whisk together the eggs and sugar until the mixture is thick and creamy. Drizzle the oil in a steady stream, whisking continuously. Slowly temper the egg mixture with the warm melted chocolate, then beat in the rest of the chocolate. Fold in the flour mixture into the egg/chocolate mixture. Do not over-beat. Line the bottom of a rectangular baking pan (35 x 24 cm) with some baking paper. Pour in the batter and smooth the top. Bake for 25 minutes in the middle rack of the oven. Take out and allow to cool. Once cooled, run a knife along the sides and tip onto a rack bottom facing up. In a small saucepan bring the cream to a gently boil. Add the chopped milk chocolate and allow to melt. Scrape the bottom of the pan every now and then to make sure nothing sticks to the bottom of the pan. Once the mixture has thickened slightly remove from heat and allow to cool a little bit. You will notice the mixture will thicken as it cools. Once it has reached a thickish consistency pour the mixture onto the cake. Place in the refrigerator and allow to cool and set for 1-2 hours. Once the chocolate glaze has set, cut into squares. 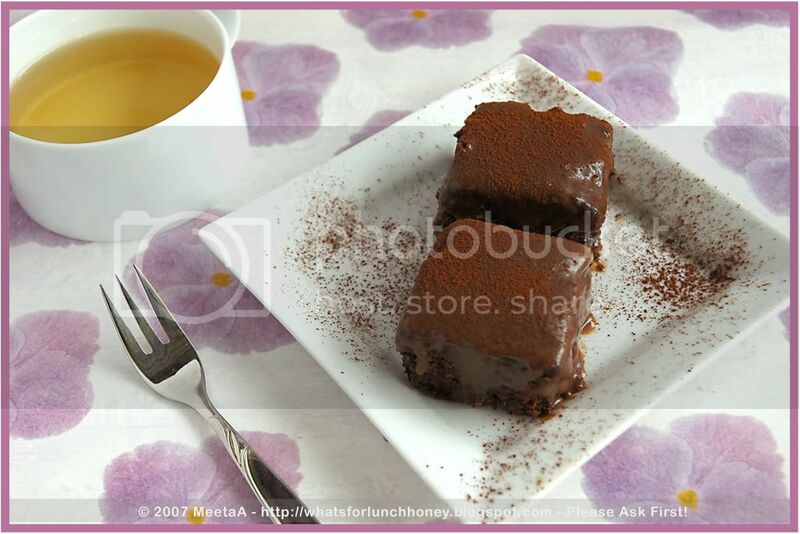 Sprinkle with 1 teaspoon of cocoa powder and serve with some hot tea or coffee. I wish I could reach out and give you all a piece of this so you can really experience the taste and texture of these brownies. They are moist, dense but soft. It's such a treat to sink your teeth into these brownies. Starting with the sweet milky chocolaty glaze down to the rich chocolate cake with the crunchy nuts and chocolate chips. The tongue bursts with flavors of deep espresso and bittersweet chocolate. Satisfying! Oh wow - this really is a chocoholics dream!! That's a great combination Meeta. Absolutely decadent looking and sinfully choco-mochha-licious. Can I repost a brownie recipe I have posted last year? It's not been an entry to any other event. now i know it for sure that u have sweet tooth, err sweet mouth ;) i have to run for extra mile just looking at those beauties. 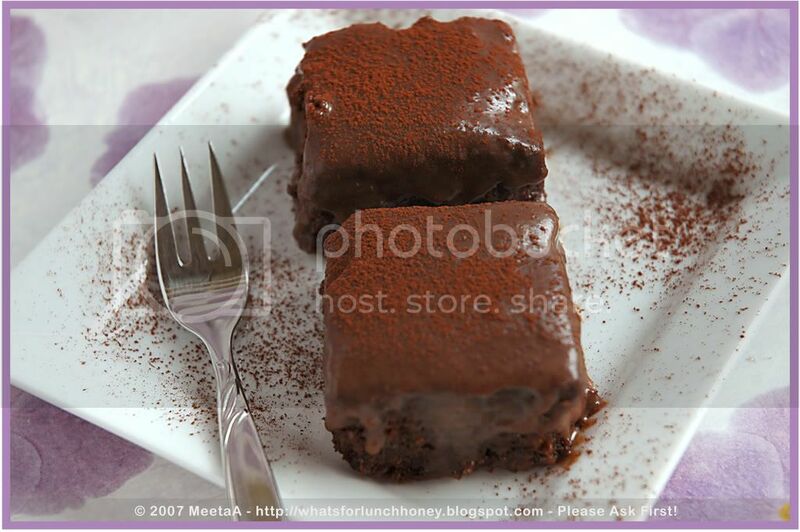 Hi Meeta, These are such luscious brownies! I cant wait for you to get another craving of chocolate! Just the pictures make my mouth water. Really fab brownies :) Yum! California walnuts . . . in Germany . . . not sure I can find those in Texas. Goodness, gracious, Meeta, temptation never looked so good! Oooooooooooh! I want to crawl into those and go to sleep! Delicious! Love the combo of chocolate and espresso, always a downfall of mine! This is really decadent, Meeta! WOW! Looks like I am not the only one with a chocoholic tooth!! LOL! Thanks for your comment, drooling. salivating and screen-licking!! 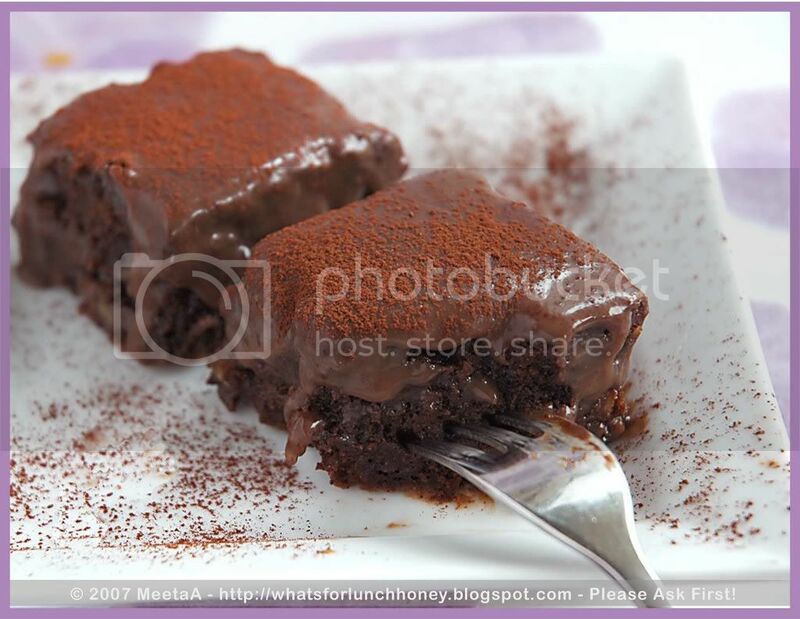 Anu - if you want to join the Browniebabe event you'll have to ask Myriam if it is OK! Priya, I got the mail and the pic! Glad you and your DH enjoyed them!! I really had a good laugh at some of the comments here. You all rock!! hmmm, the photos are so melting in my mouth (imagining!) really seductive, now I understood why chocolate stands for love, LOL! I'm dying, Meeta. Chocolate, walnuts, and espresso? Sensational. At times like these I send a quick prayer to God that you are not my neighbour, I'd be atleast 10 kilos heavier!!!! Sending you a kiss for that marvel of a creation, i guess I can make this one for a special potluck or so...i dont feel so guilty to bake them for someone else!!! Okay I am really getting tired of the droolworthy pictures today. I'm drowning here. These are just unbelievable looking. Padma, yes chocolates are pure love LOL! Susan, no you can't die on me. Who is gonna eat the rest? Thanks! Nandita, you are awful! I would certainly spoil you with all my goodies but I think we'd have a great time and with your healthy meals we'd be able to make up for all the sins I create LOL! Rachna, wake up from your trance. Please take another piece - oh no - there she goes in a trance again. It's only chocolate in these honest!! Cheryl - Drowning in my brownies? Well that's good! Right? I can totally see why you won. These look amazing! Very tempting brownies....mmmmm....I love all ur pictures,You r really talented photographer:-) U know something,I have something waiting for u in my blog. Ms Browniebabe! You need a chocoalte crown! 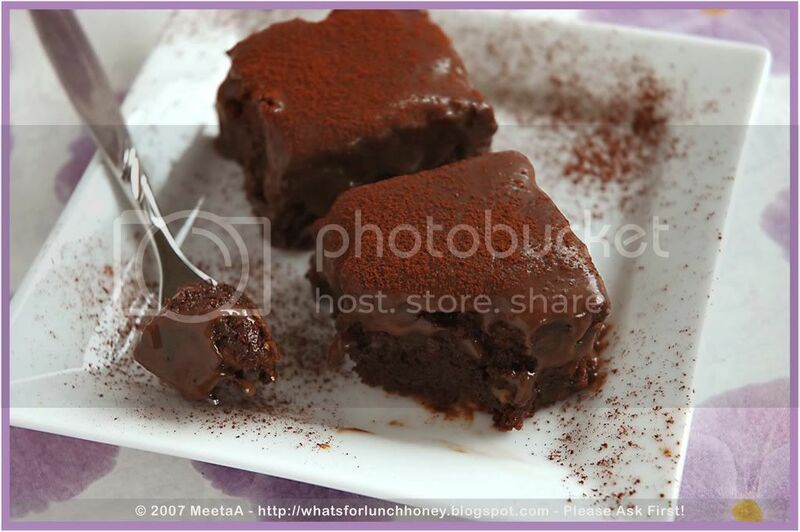 Meeta, this is the ultimate chocolate recipe for me!